The Program for Better Vision is a comprehensive, easy to follow system for improving your vision, in just 20 minutes a day. Eye exercises that have been refined over years of working with people and finding out what is effective in improving vision. Meditations, visualizations and information that take you beyond just eye exercises so you can start to understand and heal the underlying causes of your vision problems. Just listen and follow the daily Audio Vision Session, (choose the format you prefer – CD, audiotape or MP3). These powerful 20 minute sessions will ensure you are doing the right exercises in the right way for the right amount of time. We’ve heard from so many people who wanted The Program for Better Vision Audio Course in book format - so here it is! In this book, you’ll find the same powerful way to improve your vision: the 25 different exercises and techniques, detailed instructions, the 8-week training routine - as well as lots more information for your eyes! The Program for Better Vision Book is a 202 page book, and includes 5 Vision Charts, 8-week Training Routine, Advanced Exercises. *The testimonials on our website reflect the real life improvements experienced by some of our customers. We do not claim that these results are typical. Vision improvement is very personal and you may experience different results. Can I use The Program for Better Vision if…I’m nearsighted or farsighted? I have middle-aged sight? I have astigmatism? I’m sensitive to light? I suffer from eyestrain? I’m young? I’m old? People with all these visual conditions have been helped by using The Program for Better Vision. In fact, The Program is being used successfully by people from ages 8 to 90. Your age or the strength of your current glasses will not limit you - you can train yourself to have better vision. The Program for Better Vision is an educational approach to vision improvement. You’ll learn how to develop the skills that are crucial to clear eyesight - Accommodation/Focusing, Binocularity/Convergence, Peripheral Awareness and Mental Concentration. The Program gives you a truly holistic approach. You’ll improve by using the power of your mind as well as effective physical techniques and vision exercises. Your vision will become as clear and as sharp as it can possibly be. The Program for Better Vision is not designed to treat medical problems such as glaucoma and cataracts. If you have any of these problems, click here. How do I use The Program for Better Vision? Each audio CD guides you through a refreshing and effective 15-20 minute Vision Session each day for an initial 8-week period. This schedule lets you confidently proceed step by step towards better vision. You can use The Program less often than every day, but you’ll get the most from regular and consistent practice, however many times per week that might be. You will learn how to use your eyes effectively and easily throughout the day, minimizing the build-up of eye stress and possibly preventing future problems before they develop. How do I use my glasses or contacts while on The Program? You don’t necessarily have to stop using glasses completely. Some people improve while using their current glasses (contacts) less and less. Others take the intermediate step of using a weaker prescription. The Program will show you the right way to use your glasses so that your vision improves as easily and as quickly as possible. Within the initial 8-week period, many people see a 10% to 50% improvement. No matter how ‘bad’ your vision may be now - you can train yourself to have better vision. In your next consultation with your optometrist, your prescription may become weaker and you’ll be using your glasses less; you may even be able to stop using them altogether! You will see more clearly, with less effort, and you will also experience better memory, sharper concentration, more vivid imagination and a more positive self-image. And, as you continue, the greater the changes can be. Who created The Program for Better Vision? 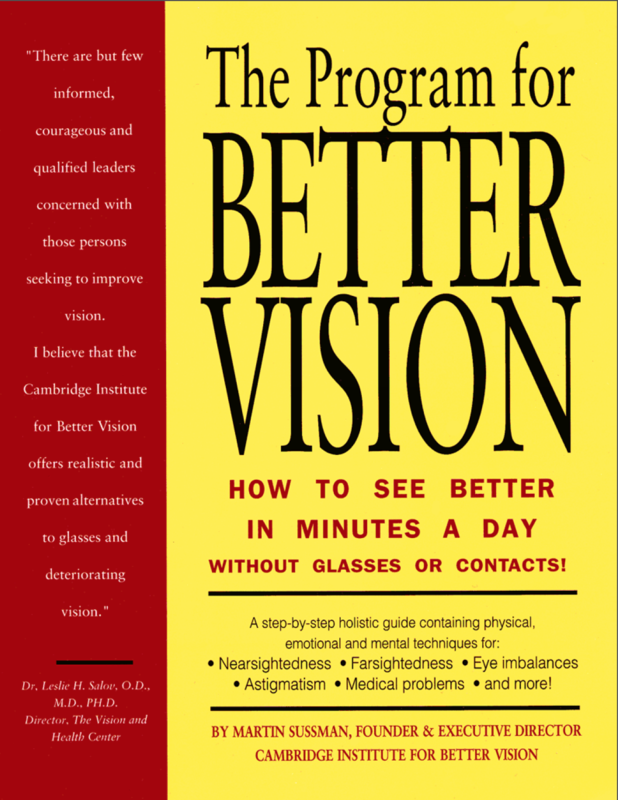 Martin Sussman, founder of the Cambridge Institute for Better Vision, created The Program for Better Vision. Since 1976, more than 250,000 people have contacted the Cambridge Institute for help with their vision. Your vision is precious, care for it wisely. There may be more than one product that could help your vision condition. Please see the VISION CONDITIONS for more information about vision and recommendations about which product to use.